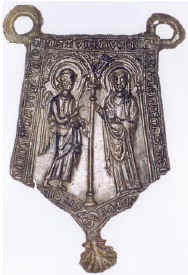 Religious pewter badge, depicting the 'Miracle Eucharist of Amsterdam'. Two angels are holding a monstrance with the Holy Eucharist. 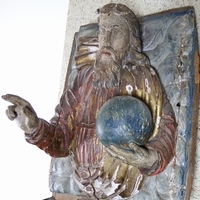 The theme of this badge is a miracle which took place in 1346 in the Kalverstraat in Amsterdam. "On the Tuesday before Easter, a dying man was given the last rites. 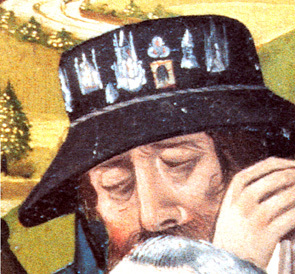 A few hours later the man vomited the Eucharist while it landed in the hearth. The next day it was found, undamaged. A year later, Bishop Jan van Arkel declared the events to have been a miracle." This was the start of Amsterdam as a centre of pilgrimage. The house on Kalverstraat was demolished and replaced by a chapel, the 'Heilige Stede Kapel' - roughly where today's Rokin Plaza stands.